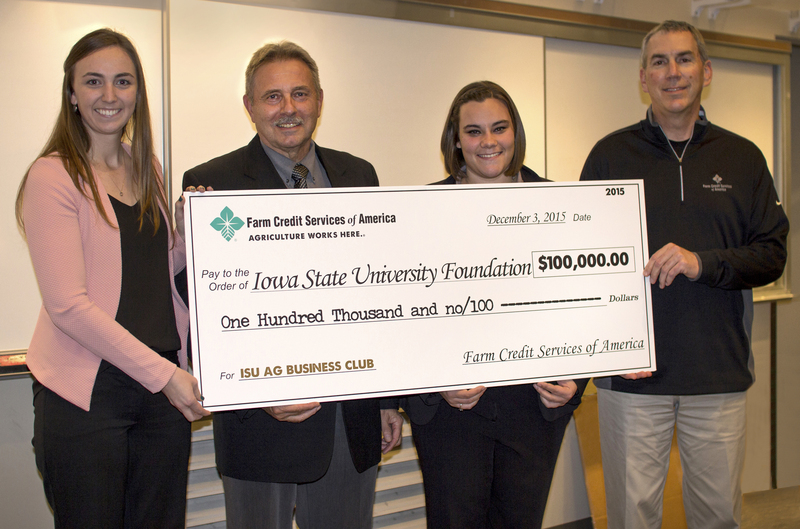 AMES, Iowa — A $100,000 gift to Iowa State University from Farm Credit Services of America (FCSAmerica) will establish the Ron Deiter ISU Agricultural Business Club Endowment. The endowment will help ensure the continued success of the award-winning student organization, which provides members with opportunities to develop their leadership skills and gain knowledge about current and emerging industry issues and career opportunities. FCSAmerica named the endowment in honor of Ron Deiter, professor of economics, who has been advising the club for 38 years and providing outstanding leadership to its student members. “The goal of this endowment is to help sustain the outstanding national leadership record of ISU’s Agricultural Business Club so students continue to have the kind of opportunities that nurture innovation and leadership in agriculture,” said Alan Erickson, regional vice president of the Marshalltown office for FCSAmerica. The endowment to the ISU Agricultural Business Club is part of FCSAmerica’s centennial celebration, which is focused on supporting agriculture for the next 100 years. Joni Erwin, a junior in agricultural business, from Crawfordsville, Iowa, and club president, said she is grateful for FCSAmerica’s generosity. “This endowment is indicative of Dr. Deiter’s dedication and passion for the industry and for connecting students to industry representatives to give them a jump start on their future,” Erwin said. The Agricultural Business Club has 274 student members. The club hosts monthly speakers, industry tours, career day events and fundraising activities. In addition to providing students with opportunities to develop their leadership skills, the club fosters a spirit of cooperation and unity among agricultural business students, generates student interest in the agricultural business curriculum and recognizes the accomplishments of outstanding students. Club activities assist in recruiting students, facilitate their transition from high school or another college and help retain them. These activities range from informal social functions to more structured activities such as a peer mentor program. This year the club was named the national outstanding chapter by the Agricultural and Applied Economics Association. The club has won the award 11 out of the past 15 years. In April, five members of the club competed in the North American Colleges and Teachers of Agriculture Agribusiness Management Competition, where the team placed first overall and claimed four of the top five individual awards. Adelai Swanson, a senior in agricultural business and a past club president, said the student members go on to have a positive impact in agriculture. As an example, she points to her father, Stuart Swanson (’90 agricultural business), who was the club’s president in 1989 and farms their third-generation family farm in Galt, Iowa. “As a farrow-to-finish hog operator and row crop producer, he still works with many of the professional contacts he made while a student participating in the club,” said Swanson. Farm Credit Services of America is proud to finance the growth of rural America, including the special needs of young and beginning producers. FCSAmerica is one of the region’s leading providers of credit and insurance services to farmers, ranchers, agribusiness and rural residents in Iowa, Nebraska, South Dakota and Wyoming. Learn more at www.fcsamerica.com. From left: Miriam Rinehart, insurance account specialist with FCServices' Webster City office; Ron Deiter, professor of economics; Joni Erwin, Agricultural Business Club president; and Alan Erickson, FCSAmerica regional vice president.